1. Can change name of White House to "Trump House, formerly known as the White House"
2. Air Force One becomes Air Force Don. 3. "Hail to the Chief" Becomes "Hail to the Donald"
4.Camp David Becomes Camp Donald. 5. Can pick from three wives for First Lady. 6. Can open casino at Camp Donald to make some cash on the side. 7. 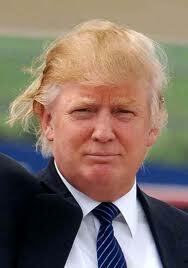 Employment numbers immediately rise with number of hair stylists, colorists, at Trump House tripled. 9. Washington Reagan airport becomes Trump Washington Reagan. 10. Can tell Obama personally 'You're fired' when taking office.